This is another pic of a another butterfly I found some time ago last year. I think it's beautiful! It dosen't have a common name as far as I know but it's sooooooo pretty! I'll look into this one as well. Known as Batesia hypoochlora. 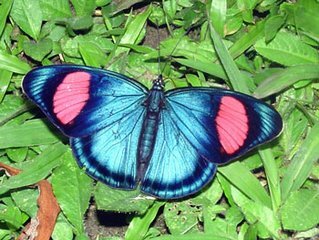 Edit: I found a really nice link with a picture of a male showing the underside and the upper side of the wings along with some info. Sorry I couldn't link it. This is due to the site not acceptinh html links. I don't know why because I could've sworn I posted a link here with 'html' in it. Oh well looks like you're just going to have to type it in. Really sorry about this.